Acting is an activity in which a story is told and played out by means of its enactment by an actor or actress who adopts a character. The power of acting out our feelings and emotions can be quite powerful and through this art form can help people to deal with things they personally don’t always know how to say or express. In fact, the art of drama and acting is used by the professional therapist as a form of therapy to help patients explore and express what they are feeling. It is called drama therapy and it is the intentional use of drama and/or theater processes to achieve therapeutic goals. Drama therapy is active and experiential. This approach can provide the context for participants to tell their stories, set goals and solve problems, express feelings, or achieve catharsis. 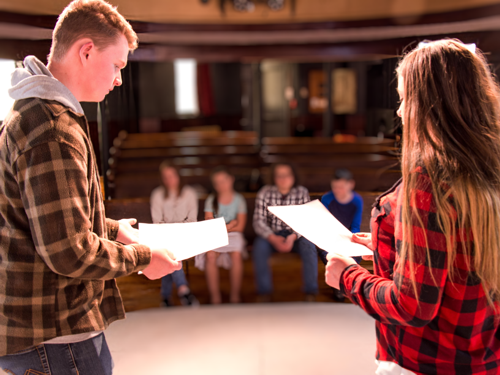 Drama therapy which in UK, Europe, Australia, and Africa is written drama therapy, is the use of theatre techniques to facilitate personal growth and promote mental health. Drama therapy is used in a wide variety of settings, including hospitals, schools, mental health centers, prisons, and businesses. Drama therapy, as a modality of the creative arts therapies, exists in many forms and can be applied to individuals, couples, families, and various groups. The theoretical foundation of drama therapy lies in drama, theater, psychology, psychotherapy, anthropology, play, as well as interactive and creative processes. Today, drama therapy is practiced around the world and there are presently academic training programs in Britain, Germany, the Netherlands, Canada, Croatia, Israel, and the United States. iFilmGroup shares the mission of providing a safe, supportive and creative environment that allows personal expression and encourages personal growth as well as allowing positive changes in their lives in a meaningful way. The iFilmGroup team has worked on projects which have included such topics as “ various addiction” (Addictions) “electronic device attachment” (Tuned In), “depression” (Struggles Within), “teen bullying” (Malicious Attack), “mental illness” and “domestic abuse” (Blue Love) Through seeing the various projects and along with speaking with the co-founders iFilmGroup and observing how they work in person and on set, you can see how drama is being used and embraced by iFilmGroup to tell stories that people can relate to when they watch them. It is through the art of drama and plays that many people learn to express themselves better and gain confidence in interaction in the world as well as how to effectively deal with personal matters and worldly issues in a more effective way. Drama and acting can be a tool in which those involved can gain some amazing benefits and encourage personal growth within individuals and positive meaningful change in a person’s life. Angel Bilagot, Registered Psychotherapist and Drama Therapist.